One of the joys of Dublin life for me is the opportunity to talk to people. I blogged about this briefly before but it's a thrill for me to sit with people, share news, views and just say hello. One of the more influential people on my youth was Pat Ingoldsby. Host of Pat's Chat, Pat's Hat, storyteller on Bosco and other poetry related children's TV shows, I completely bestow on him the credit for my love of poetry, of the rhythm and melody of words, of cadence and for looking at ordinary things in an extra-ordinary way. I didn't mind any more." These days Pat can be found selling his books to the public, just having a chat with those who are interested in his work. He's always writing, musing, creating and above all laughing. It is a pleasure to sit with someone I have the utmost respect for both creatively and personally. His views on life and experiences in selling as he does are quite unique. written by me and lovingly transcribed in her own hand. "I treasure these" she said. walked past me and my books on the pier. You shite on your own. The thing about Pat's books is that he finances them himself through his sales. He chooses to sell them to avoid the commission but also to meet people. He's got a wicked sense of humour that endears him to many and if there's a community of street traders, beggars, buskers, hawkers and homeless then Pat is a pivotal part. He knows everyone by name and they know him. I sit and chat with Pat whenever I can. I've got all of his books and treasure them. 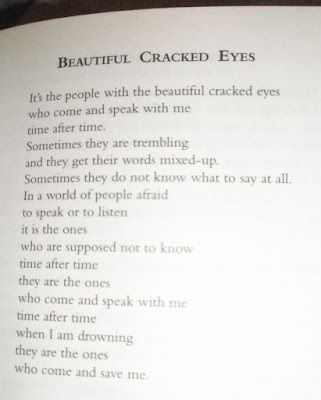 The poetry contained within inspires me, makes me happy, makes me sad and does everything that poetry is meant to do. I share them when I can. They're a beautiful glimpse into the life of a Dublin poet, who deserves to be a lot more appreciated than he is. Pat writes movingly and frankly about his times in psychiatric institutions, his battles with depression and his impaired mobility due to having polio as a child. He is a part of Dublin that is rapidly disappearing - like his beloved Malahide which is all but gone. The stigma of mental illness and his uncompromising refusal to bow to the powers that be at RTÉ have meant he has all but disappeared from the media and therefore from the views of the book-buying public. It's through personal relationships he's cultivated (for example with Des Kenny in Galway) and others he has respect for that his books reach those he doesn't sell to directly. His own website was created and managed by someone, similar to me, who just stops for a chat with him. I reckon there's a whole little community of us out there. As we sit there there's often the passers by "Jaysis, that's yer man, you know, from the telly, Pat's Hat", or the Americans looking for dead poets and not appreciating that Ireland still has its storytellers and poets and writers. "My poems do not need academics or study notes or lectures or any of the other self-serving, ego-massaging stuff which diminishes beauty and stifles wonder. All my poems need is me. All my poems need is you. It is as simple and beautiful as that." He laments the loss of manners, the too-busy-to-talk syndrome and is constantly amused by the people who stand and look at his books, leaf through them, put them down but never say a word to him. That's partly why I try to make the effort to. I get the most amazing book inscriptions too, when all I've done is stop for a second to say hello. Next time you pass Pat, think about stopping. Read a poem. Buy a book. Make a difference. Say hello. You can buy Pat's books online through Kennys.ie or check out the info on his website. Interestingly he's got his own little corner of cyberspace. I wonder if I could persuade him to start a blog? All poems written by Pat Ingoldsby and copyright to him and Willow publications. A wonderful post Darragh! Thank you. A big thank you from me too. I knew Pat very well a long time [about thirty years?] ago . I'd ask you to say hello to him from me but I knew him at a bad time in his life that he probably doesn't want to remember. I've stopped and spent hours chatting to Pat since I was a teenager. He really is someone to go to for perspective on just about anything. A really great and dedicated man. In January we asked some writers to select their highlights from 2007. "My poetry event of 2007 was the hug I got from Pat Ingoldsby on Westmoreland Street the Saturday before Christmas. I received it as a free gift alongside Can I Get in the Bath?, Pat’s latest book of hoots, howls and cackles. Pat’s the Pelé and the Elvis and the Joan of it as far as I’m concerned, our greatest loafer, our most inspirational of old laughing lovers." @grandad - I'll certainly mention you to him. His poetry is quite like blogging in a way - random condense creative takes on what's on his mind, what he sees, experiences and is passionate about. It would be interesting to see what he'd do with one. I must see if I can get a book or two to send you. @david - thanks for the comment. He is indeed a great man and I'm lucky to get a hug (or half a hug as he'd say) each time we meet. Singer David Gray, then unknown counts Pat's introduction of him on his first Irish gig as one of the highlights. On the subject of hugs, I'd recommend his poem about getting a hug from Christy (I'm not sure if it's Moore or Dignam) who took his sadness and dropped it in the river on his way over O Connell Bridge. Powerful stuff. How can the online community support our artists and poets more? "I'll certainly mention you to him"
The biggest way to help poets and artists is to buy their work. Sales in poetry are always low and the continued support from readers is essential. Poetry Ireland are going to host a few poetry sale events this year - hoping that it will encourage people to buy some books. Blog post of the week! I got my name in part because of Pat Ingoldsby. My mother had narrowed down her choice to Shane and Emmet when she saw the latter appear on the birthday list on one of his kids shows. She thought it looked nice so decided to go with it. Great post Darragh, it made me think about how big a role Pat Ingoldsby played in my childhood and how much respect he deserves now. I remember him on Pat's Hat and he was an institution around Clontarf when I was growing up. Always stopping to say hello to everyone and he always knew everyone's names. He's a national treasure. I'm definitely going to stop and buy one of his books next time I'm passing. Which street, on which day, does he sell his poetry in Dublin? Great post Darragh. I am one of the people who is always afraid to say hello. Maybe I will next time. I'll certainly stop to have a chat next time I pass and buy a book as well. Hi darragh, found your page through darren's. This is an absolutely brilliant post. I'm ashamed to say I've never stopped and talked to pat, or even read any of his books. And I used to get a bus on westmoreland Street every day! I'll make a point of stopping and buying something and having a chat next time I pass him. Good work. Thanks for the post Darragh, a really wonderful tribute to a man constantly erased from 'official' Dublin's tourist maps. Great memories of Spindle the Spider and I try to have a quick chat when I buy his books. He's a lovely, lovely man with a keen sense of the absurd and the bitter. Here's one for you Darragh. He's exactly my sort of person, I love anything of his I've ever read and yet my natural shyness around strangers means I've never gotten the balls up to go over and talk to him. Maybe I just think he'd have better things to do than talk to the likes of me? @rickoshea - I can empathise exactly with you sir, but also offer you - he's just another person. Yes he does a different job to us, may seem a bit formidable but what's the harm in going up to him and saying "hey, I like your stuff". That's what I did, and I'm glad I did. I'd say there's a fair few people who listen to the Rick O' Shea show and then meet you and think - ah he'd never be interested in talking to me, big hotshot DJ that he is. Wow, thanks everyone for the comments! @david - we should talk more about this. I'm really interested in the whole thing. @emmet - welcome to my blog! that story is cool - you should tell him. He'd be well chuffed! @deborah - please do! He's a really nice guy. @chanberry - welcome! Thanks for the comment. I hope you have a great experience. 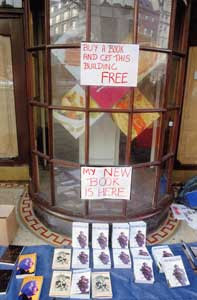 @steve - welcome to you too :) Being self employed I think Pat chooses where to sell his books. I normally meet him in Westmoreland Street during the week but he also sells in Howth as well. @Andrew - thanks for the comment! Hope you enjoy the book. @73man - thanks for the compliment. You're very right. It's what I like most about him. I hope to see him again, access more books and continue to be motivated and enthused by his infectious energy, wit and words. 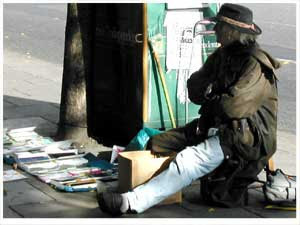 I saw that fella in Dublin when I was there, was gonna do a bit about him on my trip to dublin entry last week. ...mind you I didn't have a clue who he was. Hi Darragh, a quick comment from italy... I've just read your post about Pat while surfing the net for fresh news about the man, and I liked it a lot. thanks! I was wondering... I've known Pat and his work for more than ten years now; I met him by one of those weird and wonderful twists of fate while I was an Erasmus student in UCC: my self and my friend Fabio one morning went to the wrong lecturing hall, so instead of Old English we found thirty or fourty students drinking beer and waiting for Pat. We decided to stay, and watched and listened to a brilliant poetry reading; afterwards I stopped by to say hi and to buy one of his books (he loved the idea of an italian student coming to see him and gave me the book for a fiver - all I had then) and i was immediately conquered by the humour, the kindness and the joy he put in every second of every meeting with another fellow human being. I saw him another couple of times in Cork, went for a drink with him and others, bought all his books I could find then and in my other trips and staying in ireland. He's one of the most interesting, honest and special man i've ever met. but I was forgetting what i really wanted to say: I wonder how many people like me, like you, have 'benefited' from even the shortest meeting with Pat during the years; how many people cherish those brief moments, and his poems, as invaluable gifts of life. Can you please say hi and thanks to Pat for me when you see him next? Hi Darragh. Only dicovered your post now. I met Pat selling his books in Howth a year or two ago. Great to stop and have a chat with someone you've admired for years. I completelyagree with his recurring theme that if poetry is dissected like is done in school, you risk losing the meaning. Similarly, you should never be forced to read poetry. It took me years after I left school to voluntarily pick up a book of poetry again.